poserUkuTabs Transposer Choose how many half steps you wish to transpose the chords in this song and click on the button. UkuTabs Transposer Choose how many half steps you wish to transpose the chords in this song and click on the button. Lyrics don't fit on one line? Try landscape mode instead of portrait. This arrangement for the song is the author's own work and represents their interpretation of the song. You may only use this for private study, scholarship, or research. UkuWorld and its derivatives do not own any songs, lyrics or arrangements posted and/or printed. For the Gm7 on the “I’m having a good time”s I play Gm again and I think it sounds a little better. Had no idea this song was so simple! (Then again when your first attempt at a Queen song was Bohemian Rhapsody, anything else by them is a breeze.) I’m going to need to practice the chord changes, but it’s a lot less intimidating then I was anticipating. I’m sure it looks like a lot if you’re a beginner, but this is a great one to have as a goal. With a little dedication, you’ll have it sooner than you think. Thanks so much for posting! ? I think it could end with Bb, right after the final Eb. Yes the last chord does sound a little strange but overall this is great! Just so everyone knows, sasquatch jam is my sister. The dog’s name was Sam, he belonged to my grandma and died of old age. He was a lab and died when he was fourteen. I like to end with F?? maube that’s just me. This is awesome! This was my favorite song until one day I was listening to it with my dog and he had a seizure. He died the next day and everytime I heard the song I would cry. I haven’t listened to it for years until today I came across this and played it. I remember now how much I love it. Thank you this is an amazing song. I think that the solo at the end is just the intro’s chords while going ‘da da da da daaaaa da da daaa da’ to the tune of the intro. I agree with Tobias, the solo would be a great here. Want to talk about something more than only this song? Check out the UkuWorld Community today! Talk about similar interests or get some ukulele related help. Login with your UkuTabs account or create a new one and join the conversations. Please do not ask for strumming patterns. Sharing online how to literally play a song (i.e. strumming, rhythm and tempo) is not allowed by the MPA (Music Publishers Association) because of copyright issues. Carefully listen to the song and try to really "feel" the rhythm. Once you get the basics of strumming, I can assure you it'll go real quick. Maybe the strumming guide can help you on your way. 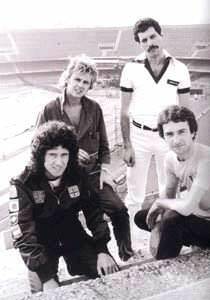 Queen were an English rock band originally consisting of four members: vocalist Freddie Mercury, guitarist Brian May, bass guitarist John Deacon, and drummer Roger Taylor. The band formed in London in 1970 after May and Taylor's former band Smile split after having released an album and single. Freddie replaced lead vocalist Tim Staffell, after the latter's departure from the original trio. There was much deliberation as to what the band's name would be. May and Taylor had settled upon the Grand Dance, derived from a C.S. Lewis Trilogy of books Out Of The Silent Planet. .
UkuTabs.com 2012-2019, Part of the UkuWorld network, Some Rights Reserved. UkuTabs does not own any songs, lyrics or arrangements posted.